There are several scenarios which behave like these cases. Is it a known bug or something else? Could you please let me know how to fix it? Thank you. The scenarios that install with the mod are rather old, having been created when the mod was newly created. Since then the mod has undergone numerous changes. Some of those changes are not reflected in the scenarios. If the error is a map name change, then that is something that you can easily change. 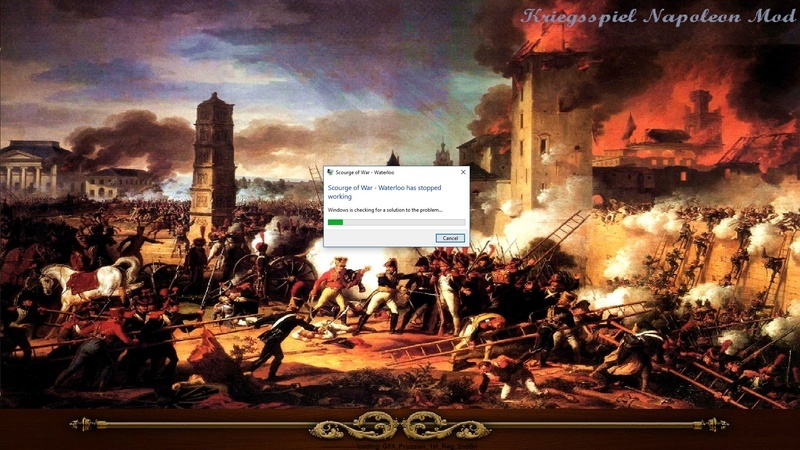 Open the KS Napoleon mod folder. Open the folder of the scenario you are having problems with. Inside you'll see a file named scenario.ini. Open this file with any text editor. Near the bottom of this file you will see a line that begins, map=, followed by the name of the map. Open the folder named Maps which is also in the KS Napoleon Mod folder. Inside it, you will find numerous files that begin with, Nap_, followed by a country name. Find that one that nearly matches the one in the ini file. That's the name you want in the ini file. So for example, French Scenario 1 has, Nap_Rus_Elkhorn listed. However, in the maps folder, the name has been changed to, Nap_Rus_Elkhorn_KS. Change the entry in the scenario.ini file to the new name, Nap_Rus_Elkhorn_KS. Hello, thank you for the quick reply. I also notice the missing files like the PRU_FUS_06_1ST and the CVNorth.lsl. There might be some others. I tried to search for those in the mod folders but found none. As you said that the scenarios are quite old, maybe the names of those missing files had been changed with the updates? The class name was changed. Instead of PRU_FUS_06_1ST, it should be, PRU_FUS_1ST. Open the proper scenario folder and then file scenario.csv. Use Excel if you have it or you can also use a text editor. Replace all the instances of that entry, (there may well be more than one). CVNorth is an SOWGB expansion map. If you have the Chancellorsville expansion for SOWGB, you'll find the file in the Scourge of War - Gettysburg \Base\Maps folder. To use it in SOWWL, create a folder named, GB lsl Files, inside the Mods folder of SOWWL. Inside of that create another folder names Maps. Copy the lsl file into the new Maps folder. Start the game, and activate the new mod you just created, (i.e. GB lsl Files). Ah, it makes sense now. Thank you for the help. I want to play KS mod but don't know how I should do it, TC all the units and play like other games or let the AI handle combat and only interfere when needed. I believe the KS group plays with HITS? P/s: Still same french scenario 12, after renaming PRU_FUS_06_1ST to PRU_FUS_1ST (I can't find PRU_FUS_1ST file in sprite mod folder; Could you show me where it is? ), another error occurs, it's now PRU_MUS_06. When I searched for those names in the sprite mod, there are several files with PRU_MUS name, the difference is numbers attached. So, it seems hard to rename all these files alone especially if one is clueless on how all of this works. This leads to my question: are the scenarios a viable choice to play KS mod or it's better use sandbox? I know that not all scenarios are erroneous. When you come across a class name that is no longer used, here is the procedure to change it. Open the master OOB that was used to create the scenario. They are found on the folder nameed OOBs. In this case, it is OOB_SB_KS_NAP_Prussia_1806.csv. Column B contains a unique ID. It is the same ID that is listed in column H of scenario.csv. You can then copy and paste the correct Class name, (found in column K), into the scenario. In the specific case of French Scenario 12, there are a number of instances that have to be changed. The brigades all have their historic battalions, so you can copy and paste several entries at once. If you don't want to go through the trouble, you can save yourself time by just picking one of the musketeer sprites and do a universal find/replace. The 1806 and 1807 OOBs have the most of these kind of changes as we remade large number of those sprites. Nice. I just opened the csv files and got overwhelmed by the amount of units. This is going to take me some times to sort through. Thank you very much for the guide. Sorry, I forgot to answer the other part of your question. Yes, the KS group plays using HITS and couriers. Doing so, allows us to come as close as possible to what it was like commanding troops in the early 19th century. Different players have different views on whether to TC or not. I almost never do, for two reasons. 1. Not doing so injects a degree of uncertainty into the battle because each AI commander has his own idea on how to carry out your orders. They range from ignoring them to following them exactly. It will just depend on his view of the battle. 2. In many situations, the AI is just a better commander. I like to play as a division commander. As such, I cannot be everywhere at once, micro-managing all those battalions. With everybody TCd, the units are just zombies and can become easy pickings for the enemy if I am not close by. There are exceptions of course. I will often TC a battery commander and place the guns exactly where I want them. Once they are in place and firing, I unTC him. I will often TC a cavalry commander when I worry he may use his men too aggressively or inappropriately. I usually only set him loose in the later stages of the battle when tired enemy formations become juicy targets. If I want a battalion to occupy a certain spot or perform a certain task, rather than TC him, I will detach him from the brigade and command him myself. This can be very useful for skirmishers or a flanking unit. When I am done with him, I reattach him to his brigade. Sorry for asking too many questions. In some scenarios, I see that the OOB's names of divisions are incorrect. For example, in british scenario 6, instead of Maj Gen Coleville, it is 5-9 pounder and also in other scenarios, infantry battalions are named as artillery batteries. It's not a big issue but I'm curious about it. I can't seem to find where to rename those units. The 1815 British OOB underwent a number of revisions, so the IDs do not match the older scenarios. To fix that issue, change the ID in scenario.csv, (column H), to that of column B of the OOB. It is likely that nearly all the British entries will have to be changed. Making changes now. Both sides' OOBS need some altering. I'll have a look at other scenarios as well. Will there be newer KS scenarios for the public in the future? I played some of them and I have to say commanding an Austrian line brigade against French columns is both amazing and depressing. The KS group plays 3 times per week, so we have many scenarios. The problem is that they were created with MP playing in mind. Finding ones that are also good in SP mode is the challenge. If you play in HITS mode, you can expect to lose frequently. Those column attacks get worse if a cavalry regiment supports the advance. It forces your battalions into square which the enemy infantry will attack with gusto. Once the square breaks, the cavalry moves in to finish the job. I've seen entire brigades wiped out in 5 minutes this way. It does take your breath away. It also frees you up so you can ride around and observe the rest of the battle. I play, rather try to play with HITS. It definitely feels different than the old RTS way. Sometimes, it's frustrating when a battalion disobeys your command. Atm, I mainly play at brigade level. I don't know the requirement to join KS MP session. Do I have to be good with the game? How long does one session last? I've only had SOW for about a month, there are so many things I have to learn about the mechanics. 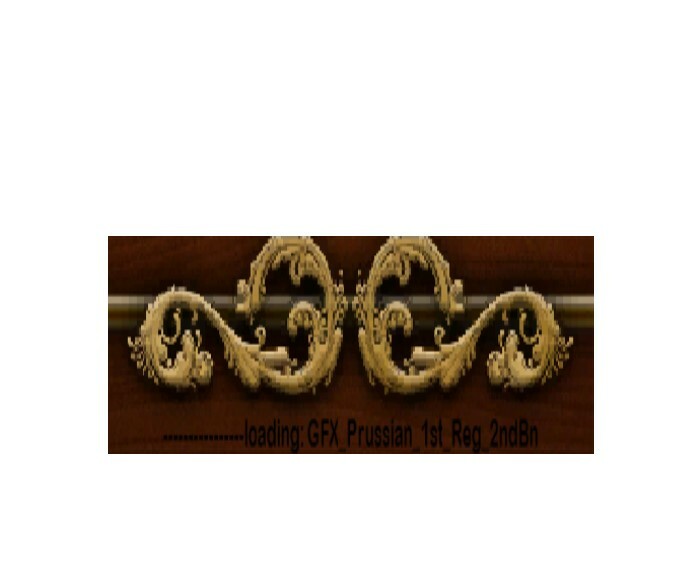 You are most welcome to join our games whenever you like. Taking command of a brigade in the battle is no problem. Don't worry if you are not proficient, the only way to learn is to join a battle and make every mistake that is possible to make. Some of us have been playing for years and still make some unbelievable blunders. We are a pretty easy going group where winning or losing is much less important than having a good time. We typically play against the AI so there is much less pressure on players. The battles are nearly all set to be 3 hours long. Although with pre-battle planning and the inevitable lag we sometimes get, they can last up to 4 hours. We start at 14:00 EST, (19:00 GMT), Mon, Wed, Fri, Sun, as that allows players from both the US and Europe to join. The announcement for the game is always posted in the Impromptu Games thread, usually the day of the battle. We use TeamSpeak to communicate. 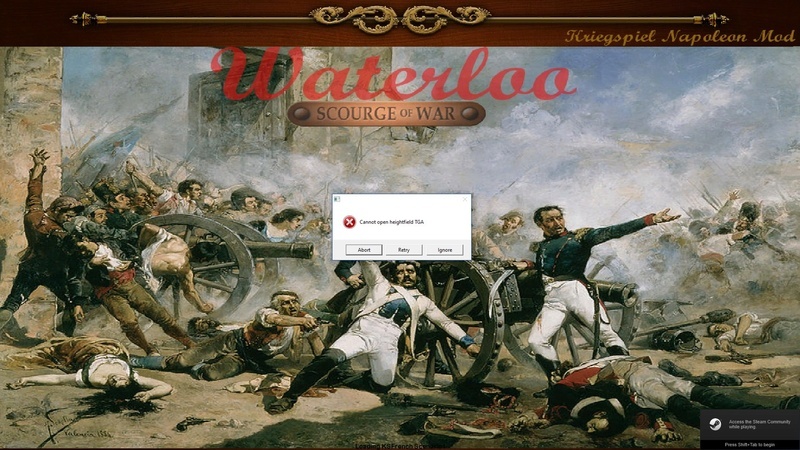 If you are not familiar with it, the details are near the bottom of the first post in the Setup for SOWWL Napoleon Games for Kreigsspiel Style, (it where you got the download links for the mod). This is very tempting. I'll try to join some time later. Although, I'm concerned about the lag as I am from Asia (GMT +7) and I expect the ping from here to wherever the server is would be higher than 200 ms. It would not be fun for all if it happens. Else, I could arrange a sick day once in a while for a battle session . Ouch! That would be 0200. Make sure your ADC ties you to the saddle so you don't fall off your horse when you doze off. Hello Sir Turtleton, good to see a new name on the forums. We have had one player who used to join us fairly regularly from Australia and I don't recall we had too much lag with his connection. One of our group is in Puerto Rico (or is it Costa Rica?) and usually his coal-fired connection is the one that dictates our MP game speed so as long as you have a reasonably stable connection (no drops) a slow connection is not likely to be an issue. We have just begun another of our mini campaigns using the "Campaigns on the Danube 1805-1809" software and have our first battle generated by the map moves on the main strategic map today. No matter what your skill level you are always welcome. Everyone dies the first time - don't worry and even our seasoned players get wiped out sometimes so don't feel like your lack of experience might be letting anyone down. If you start with an infantry brigade in your first battle and end up with 1 battalion left - don't worry - you're doing fine. Yeah, that's one of my concerns but it could be arranged though I might not play as regular as I want to. Have to tell the ADC to yell at the QM to pack more coffee instead of tea. Thank you for the very friendly welcome. I'm from Vietnam and have been a fan of this musket era for quite some time. I normally play Wargames: Red Dragon with some french guys and in my experience, the ping is consistently at 200-300 ms and steady, except for stormy days when connection can be jerky. So you play campaigns as well (with historical OOB or is there room for some fantasy?). That's very enticing for me. Will definitely join you guys for a battle later on. We've done both historical and fantasy campaigns (based on a historical premise). Our regular MP group is currently quite small which is why its difficult to run campaigns. If we were to get more players I would be motivated to run more campaigns because battles in context are always more fun that battles that lack context. How many players do you normally have in one battle? I believe that SOWWL's MP can have up to 20 people, is that correct? It's a shame that there aren't many who play this game. It's likely better than TW in gameplay. P/s: I had a battle with KS mod using HITS and noticed something. Sometimes the battalions automatically withdrawn when their morale was still high, fatigue is about ok (they are not TCed). My understanding is that there were some enemy threatened their flank so they retreated. Not sure if that's the behaviour the AI is scripted. Another thing is that my battalions occasionally didn't fire at the enemy despise the target UI showed that enemy battalion is primary target. Even when I moved them up to point blank, they still didn't fire. Sometimes I only had to move them around a bit to start the firefight. Ammunition, morale and fatigue were high, units were not TCed. This also happened when I made my units form squares. I checked there were no friendly in front and this behaviour occured for unit which was alone on the flank (no overlapping). The last thing is at the beginning of the game, I made 1 battalion as skirmisher then as the battle went on, I can't seem to switch it back to line without TC that battalion.Else, it formed skirmish line and moved up to engage enemy. Is this normal? Yesterday's battle had 6 human players battling the AI. The humans lost. One player was lured into an ambushed and became a spectator in roughly 5 minutes. Battalions will fall back for a several reasons; if they overlap with another friendly unit, they feel their flanks are threatened or they are of lower quality and become frightened, (the morale bar won't show anything is amiss). Some of this has been refined in the current version of the AI, (not yet released), and some additions have been added. Infantry units that are nearby a retreating unit will have their morale temporarily lowered. This has the potential of causing a chain reaction, resulting in several battalions fleeing en masse. I had a brigade dissolve this way in a battle a few days ago. Additionally, when a brigade reaches a low level of morale, it will detach itself from the division and leave the battle as it is no longer combat effective. The shooting problem is a line of sight issue. The LOS code is a bit buggy. It shows up primarily on hilly maps. Nothing can be done about that as we don't have access to that. Skirmishers have also been reworked in the new AI. Previously, some units would always fight in skirmish formation. Now there are a few that will as they did historically, but the majority will revert to line formation once the two lines come close together. Thank you for the explanation. This is some fine coding you guys did with the AI. In this battle, I had 2 battalions retreated almost simultaneously and left the flank quite open. Good thing they didn't withdraw too far away and I had 1 reserved battalion nearby. I take it the battalion AI will try to (or sometimes fails to) form line when cavalry is nearby. I had an instance where a battalion happily blazed away at a dragoon squadron only to be charged instantly. It's both nice and sad to watch that at the same time (and make sure to get the general out of the way too, learned it the hard way ). For the skirmishers, I take it once you designate a unit as skirmisher, it will stay in that formation when engaged for the rest of the game? So, we'll have even better AI and skirmisher's behaviours later ? On yesterday's battle, AI can ambush? No, but I moved into an area that offered a juicy target of what I thought were unsupported guns but the enemy had several brigades of cavalry deeper in his rear in support and the lay of the land meant I didn't see these moving to cut me off until it was too late. Actually, from start to finish it was 10 minutes. 10 minutes to get 3 regiments of heavy cavalry completely slaughtered and their brigade commander (me) killed. We took a few of the beggars with us though! In the new AI configuration we have allowed a brigade to put out a certain number of battalions into skirmish order depending on its size (IIRC at 6 battalions, 2 battalions can skirmish, lower than 6 battalions, a single one will) and this is modified depending on the brigades stance. I think a French brigade with attack orders will always be allowed 2 skirmish battalions and there are some brigades (eg early Prussians, Spanish and Russians) that do not have any skirmishers at all. A skirmishing unit need not stay in skirmish order for the duration. You can shift it back into line. With an especially proficient training doctrine such as the French have, you can take one unit out of sk order after it has fired off much of its ammo (say) and then send a second unit forward that is fresher in its place.